You've seen little peeks of this, but now I'm excited to share with you this project that is very near and dear to my crafting heart. 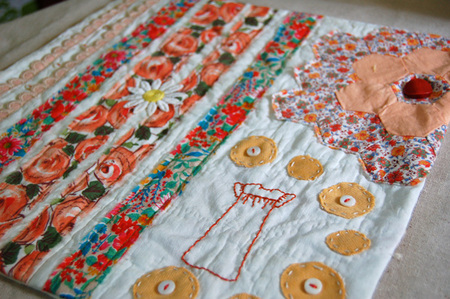 It's a project that stemmed from my love of vintage patterns. I'm drawn to these for many reasons - the way in which it doesn't involve buying something new; the classic styles of the past that I love; and in general, I think - the connection to the past. I think a lot about the past of these little crispy-papered patterns - who might have made them before and when, who might have worn the results, and even who designed them. Which leads to all sorts of thought about clothing and gender and well, I told you I thought about them a lot. I'll spare you from going on (and on). So from all that thinking came this series of little quilts - each inspired by a different vintage pattern, and each made entirely of vintage materials (right down to the thread). 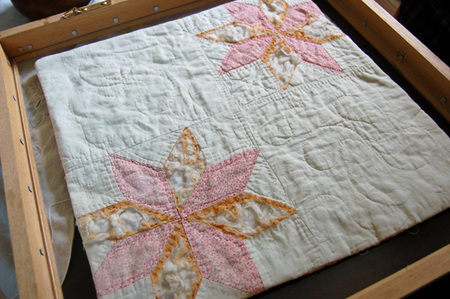 The foundation of each piece is an old quilt that was in disrepair beyond any other kind of use (seen in the photo above, on the 'back' of the quilt). Each piece - though quite different from one another- has an embroidered dress as the central theme. I've been using the full spectrum of treasured vintage bits and bobs I have, including pieces of (unwearable) old dresses. I've worked on them slowly but steadily in the past few months - it's been one of those projects that sometimes has me bolting upright in the middle of the night with an idea. Love that. 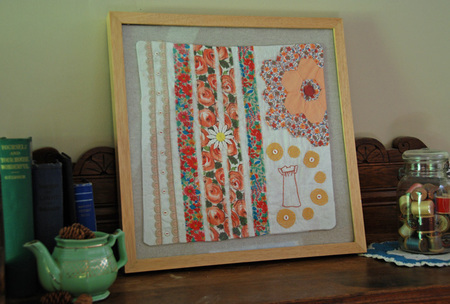 This is the first of the quilts that I've framed. I'm not entirely convinced this is the framing solution I love, so I'm still thinking about other options (I'd love to use old and found large frames, but for all my thrifting luck, frames just don't seem to appear). These little quilts will be in a gallery show I'll be having in April of 2008, at Edith & Edna - to coincide with the release of the book. It's going to be a busy - and fun - spring!